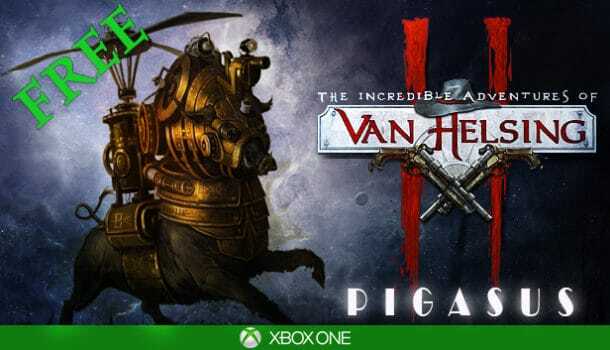 Van Helsing II – Pigasus DLC for Free on Xbox One! Is it a bird, is it a plane… is it even real? Well, what is it? That’s right! It’s the Pigasus! Download the DLC for free if you own The Incredible Adventures of Van Helsing II on Xbox One! The Pigasus is the true wonder of weird science, created to explore the depths of the murky Otherworld (better known as the Ink) – and retrieve information from the world beyond, not to mention the large amounts of extremely rare artifacts. Spend some precious Essence, summon this strange creature to your Lair… and buy some rare new items from the Pigasus! The Pigasus DLC unlocks the Pigasus: you can summon a new kind of creature by spending Essence and you can purchase powerful items in your Lair from it. Important note: You need to complete the Van Helsing II campaign with a Veteran character in order to be able to play this DLC. If you think you’re ready, download it from the Xbox Store right now, for free!